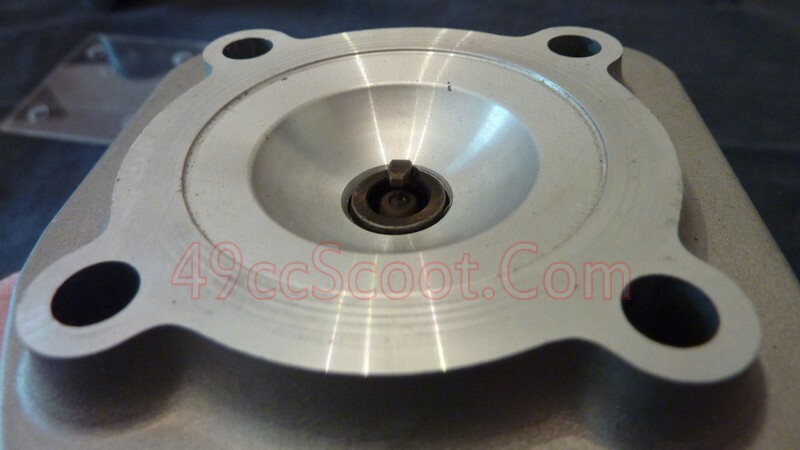 You'll need your cylinder, piston with piston rings, head gasket, and cylinder head. 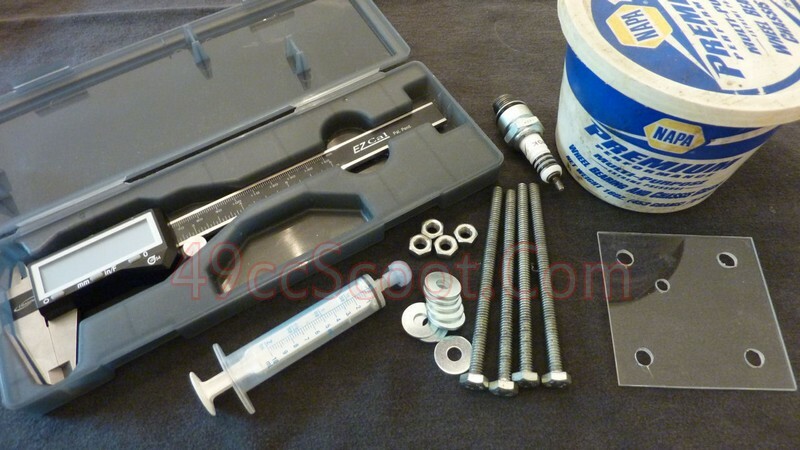 You'll also need a precise way to measure bore and stroke/depth, a syringe or buret to measure volume, a spark plug that fits the head you're testing, a piece of plexiglass, and grease. A buret is probably the most accurate way to measure volumes, but you can usually find a syringe in a local pharmacy that measures mL/cc (same thing) cheap and it's still pretty accurate. Ideally the spark plug you use in the head for measurements should be the same thing you will normally use in the engine. 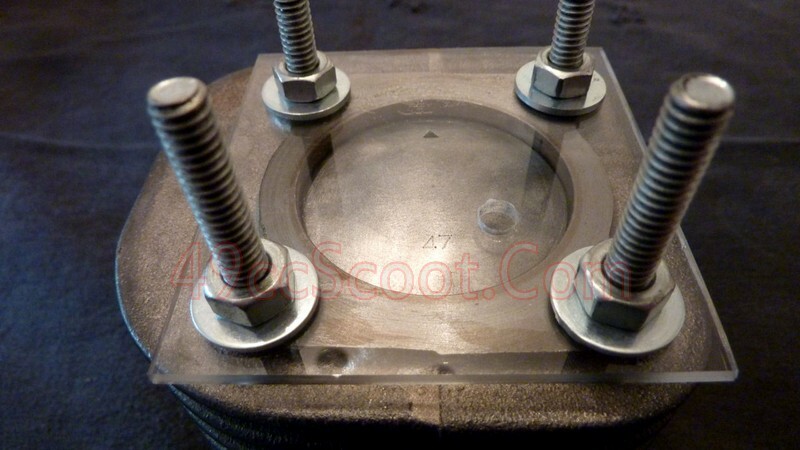 I use regular wheel bearing grease to seal the plexiglass to the head and cylinder. Some people use a piece of plexiglass with only a fill hole in it to add fluid. I like to drill mine so I can bolt it to the head and cylinder. As long as it stays put while measuring, either is fine. Let's start out with the easiest measurements first. The head gasket volume is easiest to calculate, rather than measuring the volume of fluid you can fit into it with a syringe or buret. 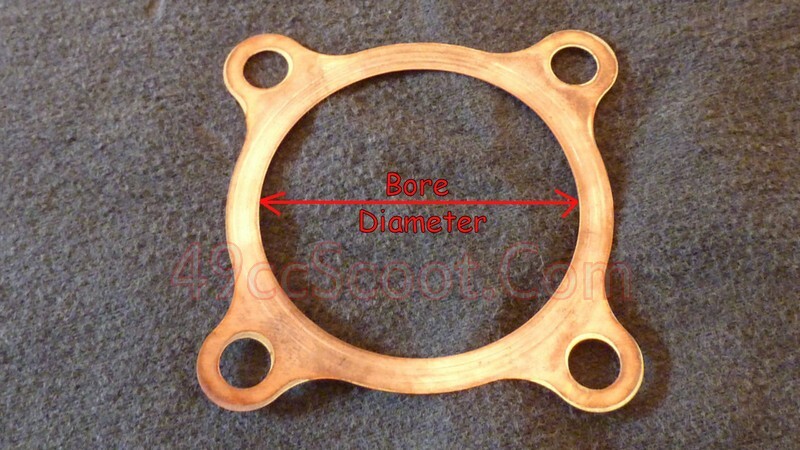 Begin by measuring the diameter of the head gasket's bore, and write it down. 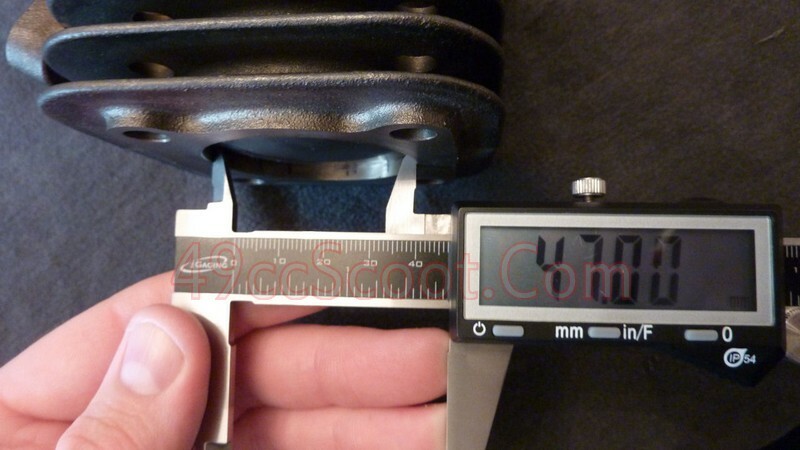 This one is 48.9mm. Then measure the thickness of the head gasket and write that down as well. As you see, this one is 0.3mm thick. Those are the only measurements you need for the head gasket, so now we can move on to measuring the volume of the head. The shape of the combustion chamber makes it much easier and faster to determine it's volume by measuring how much fluid you can fit into it. Install the spark plug into the head. For the most precise measurement, torque it to the same specifications you would use if assembling the engine. Apply a thin layer of grease around the sealing surface of the head. As you can see, it takes very little to seal. Don't overdo it, because you don't want grease in the combustion chamber that could throw off your measurements. Install the plexiglass peice over the head. As I mentioned earlier, you can choose to only have a fill hole and allow the grease to keep the plexiglass in place. I like to secure it with nuts and bolts so I know it won't move if I need to tilt it to get rid of an air bubble. If you use nuts and bolts, don't get them too tight. I only install them finger tight. Too much torque and you could crack the plexiglass or cause it to distort and throw off your measurements. It doesn't take much to hold it in place for these purposes. Fill your buret or syringe with water. Get all of the air bubbles out. Some use food coloring to see the water easier. I normally do not. It's not that hard to see air bubbles even with clear water. I colored this water a bit just to be sure the camera picked everything up. 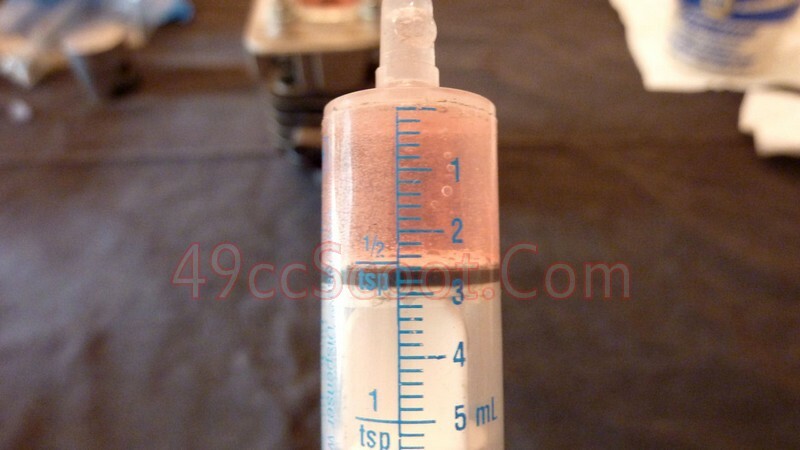 Note the volume of fluid in the syringe or buret when full. This one holds 10cc. 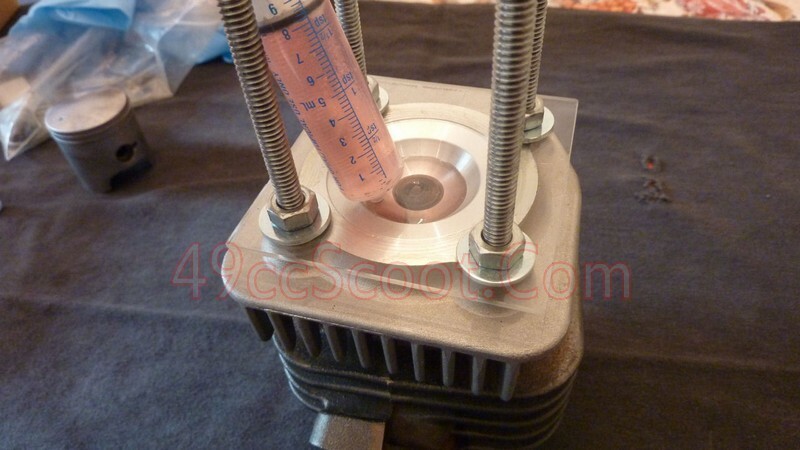 Begin using your buret or syringe to fill the cylinder head. A you fill it, make sure water is not seeping out of the edges or past the spark plug. Get all of the air bubbles out, like the one in the top left corner of the head in this image. You can usually tilt the head so that the air bubble is below your fill hole, and the air bubble will rise up to it. It may take a bit of steering. Sometimes you may need to lightly tap the glass to get the air bubble moving. If so, do it gently so you aren't pushing fluid out of the fill hole. One the bubble is at the fill hole, fill it up with fluid. You should see no air bubbles by the time you are finished. Now note the amount of fluid left in the buret or syringe. In this case, I have 2.6cc remaining. I started with 10cc. Subtract the remaining cc from the starting cc, and that's the volume of the combustion chamber. For me, its' 10cc - 2.6cc = 7.4cc combustion chamber volume. 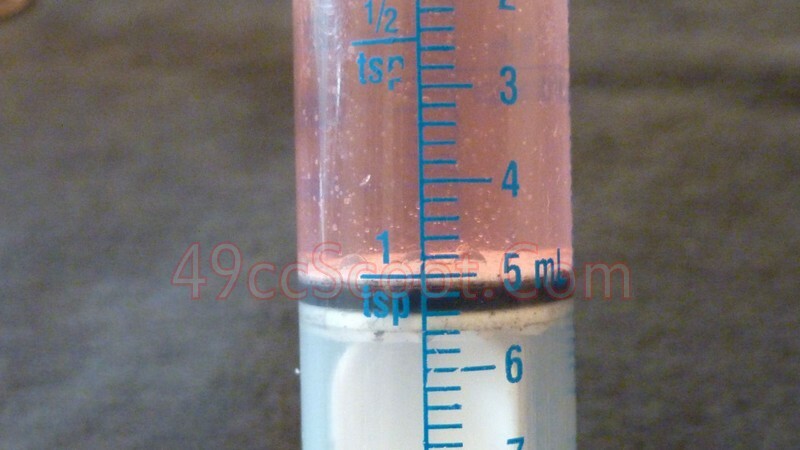 You can also count the empty area on the syringe or buret to see the volume. Your choice. 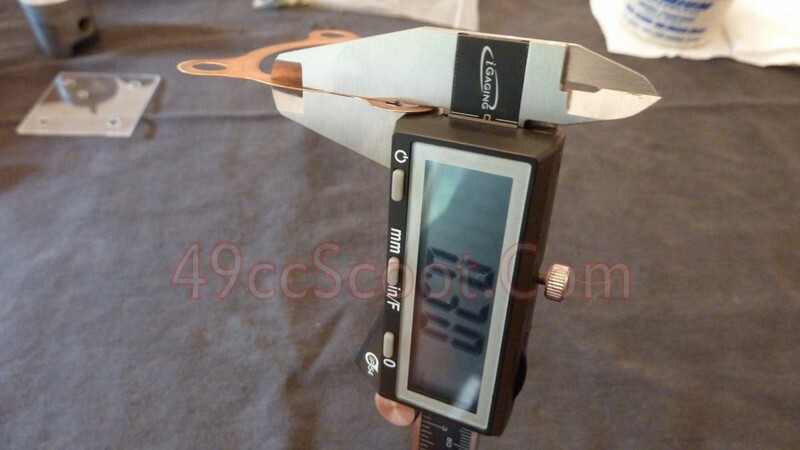 Now you can move on to measuring the volume that the piston crown displaces. 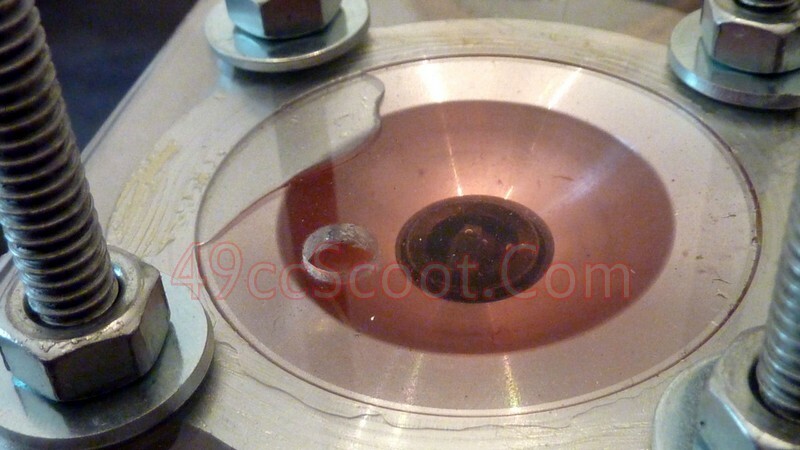 This is not necessary when using a piston with a completely flat top, but usually they are domed. 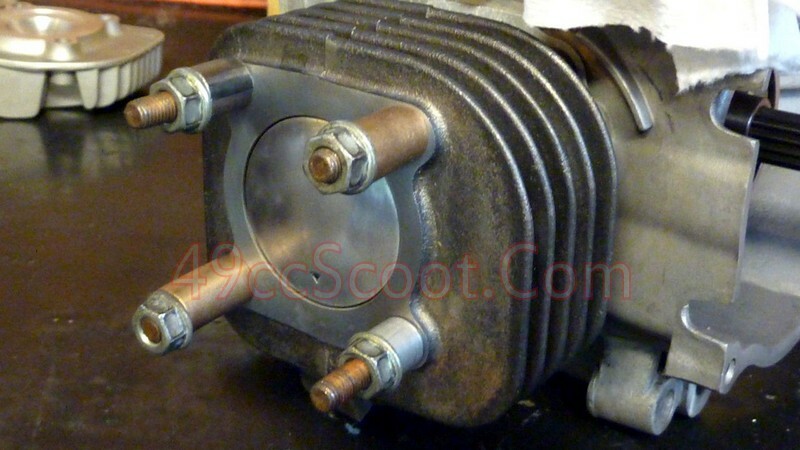 Start out by measuring the cylinder bore and writing it down. This one is 47mm. Slide the piston (with rings installed) into the cylinder. You can do this with the piston crown anywhere above the open ports, but it's easiest to position the piston near the top of the cylinder. The piston must be totally below the deck of the cylinder though, preferably with a small amount of clearance even at it's highest point. 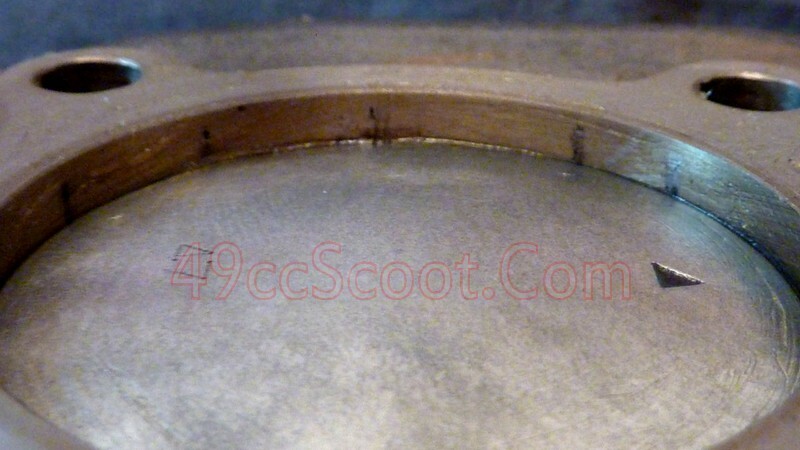 As long as everything is in decent condition, the piston rings should hold the piston in position pretty securely. If you have any doubts, set the cylinder on a flat surface and position something under the piston so it cannot move down in the cylinder. 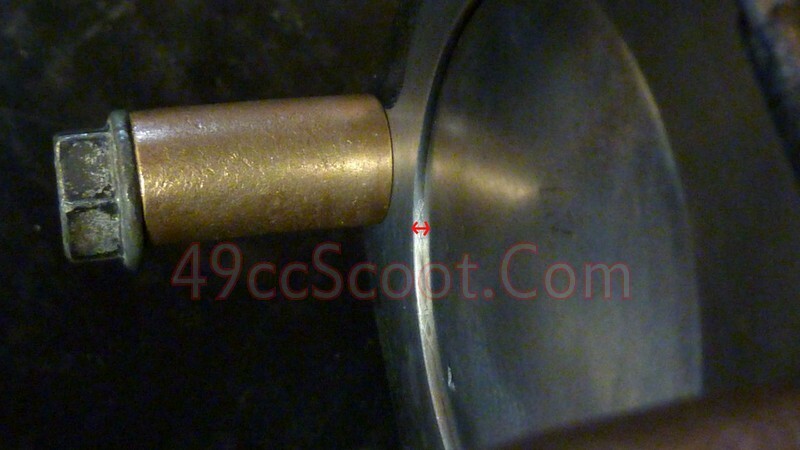 Measure the distance from the edge of the piston to the cylinder's deck and write it down. This one is 3.9mm. Be sure the piston is straight in the bore by measuring at multiple points. If it's not, do your best to get it level before noting the measurement. 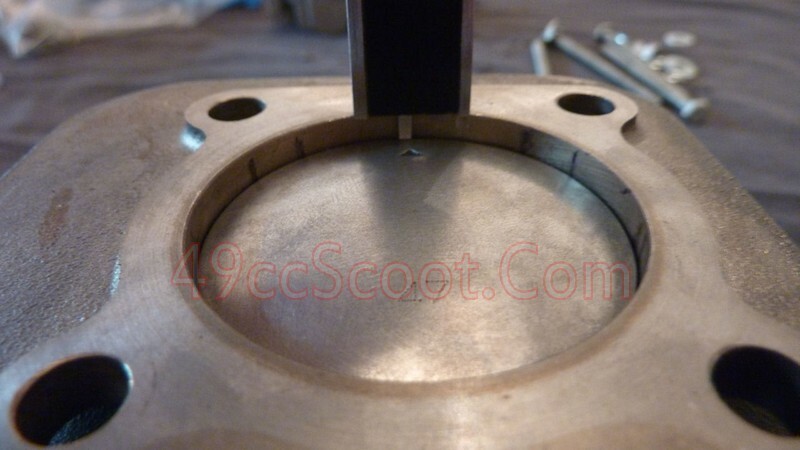 Apply a thin coat of grease to the cylinder's sealing surface as you did when measuring the head. 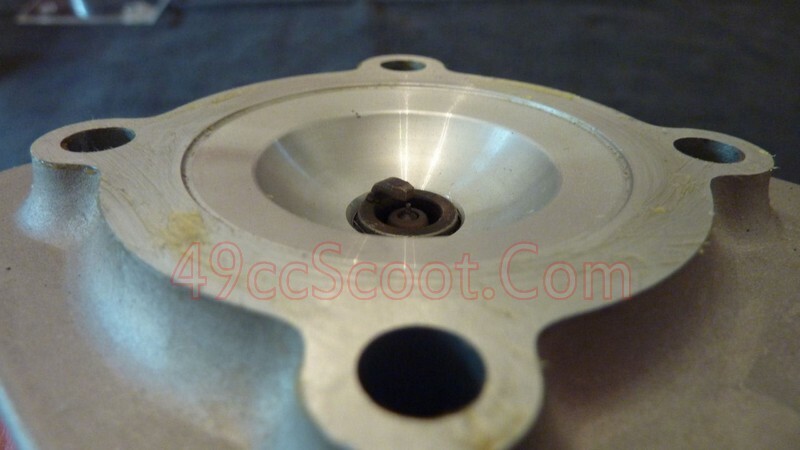 You will also need to put a very thin coating of grease around the outer edge of the piston's crown to be sure fluid does not pass by. Make this as thin as possible for the most accurate measurement. Attach the plexiglass, just as described with the head measurements. Again, if you choose to use nuts and bolts, just get them finger tight. 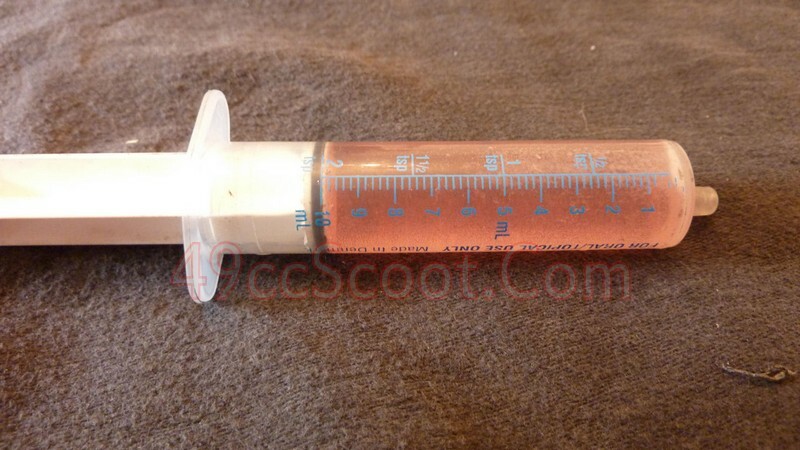 Fill your syringe or buret again, and completely fill above the piston. Get all of the air bubbles out. Write down the amount of fluid used to fill the cylinder. In this case I had 5.1cc remaining in a 10cc syringe, so the cylinder is holding 4.9cc above the piston. Next, you'll need to measure the distance from the cylinder's deck to the top of the exhaust port and write that down. In my case it's 22.5mm. 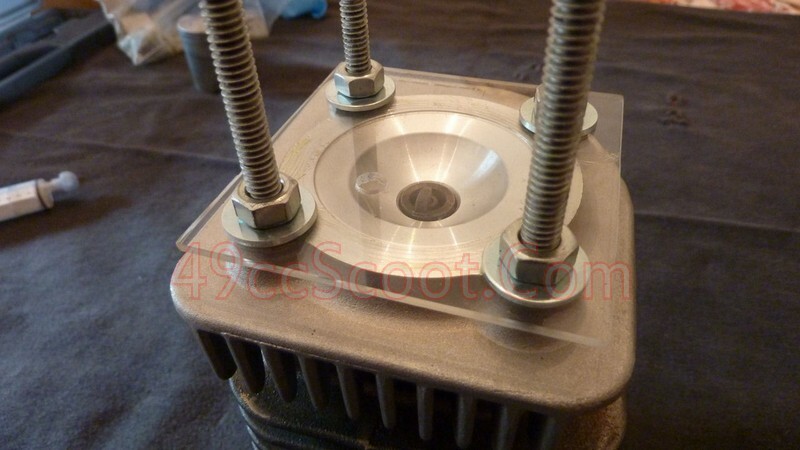 You'll need to install the cylinder and piston on the engine for the final step. 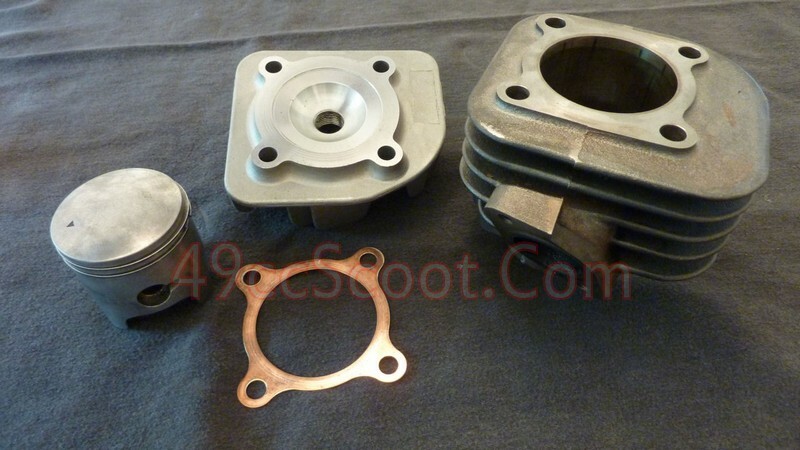 Use any base gaskets or spacers that you would normally use with the cylinder. Use washers or spacers and the cylinder nuts to install the cylinder and torque it down for an accurate measurement. 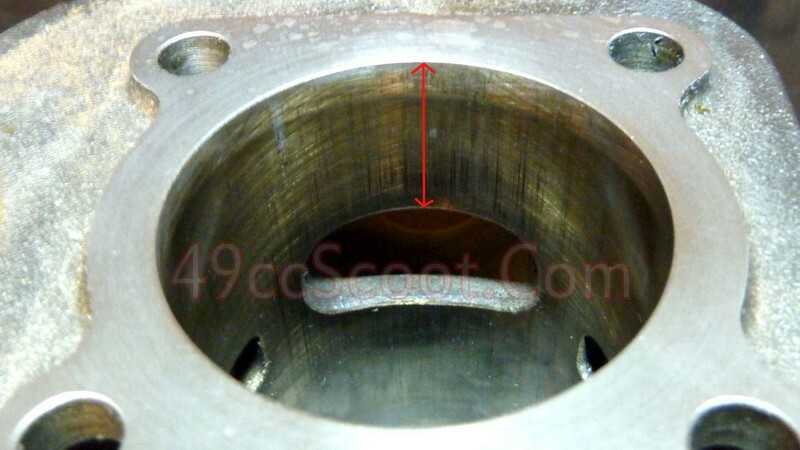 Measure the depth of the piston below deck at top dead center, the piston's highest point in the bore. 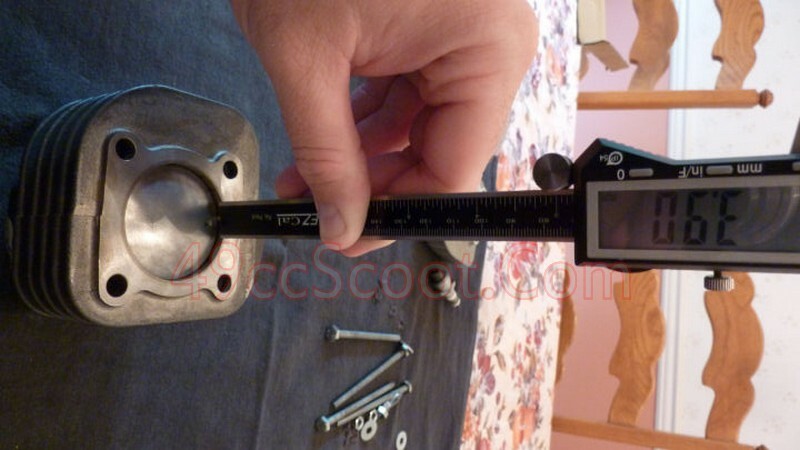 Take the measurement on the outer edge of the piston and write it down. This one is 0.6mm below the deck. If you know the stroke of your crankshaft, write it down now. This one is a stock 1E40QMB with a 39.2mm stroke. 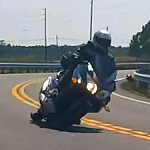 If you do not know the stroke of your engine, measure the distance the piston travels from top dead center to bottom dead center and that is your stroke. A bit of good news... you should now have all of the measurements you need to calculate your corrected and uncorrected compression ratio. You should have made a list of measurements something like mine below. Time to start turning those measurements into compression figures. Begin by calculating your engine's displacement. Use the following formula to find the displacement volume. Remember that you have measured bore diameter, and radius is half of the diameter. I am using 3.14159 to represent pi. Next, we need to determine the trapped volume. 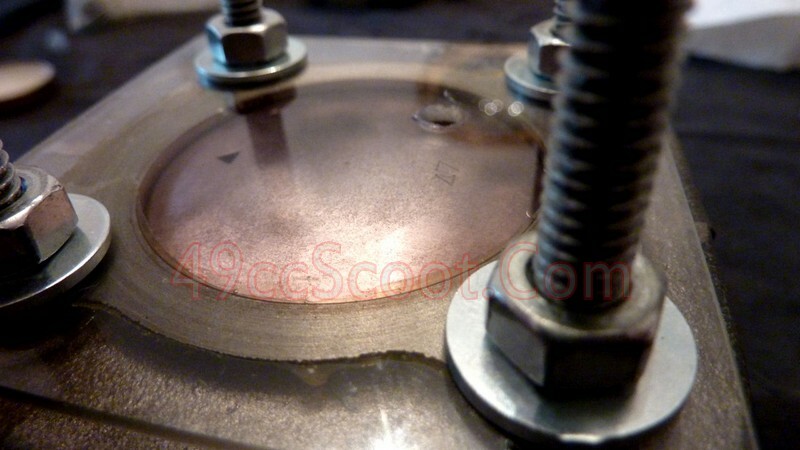 That's the displacement above the piston's crown at top dead center. 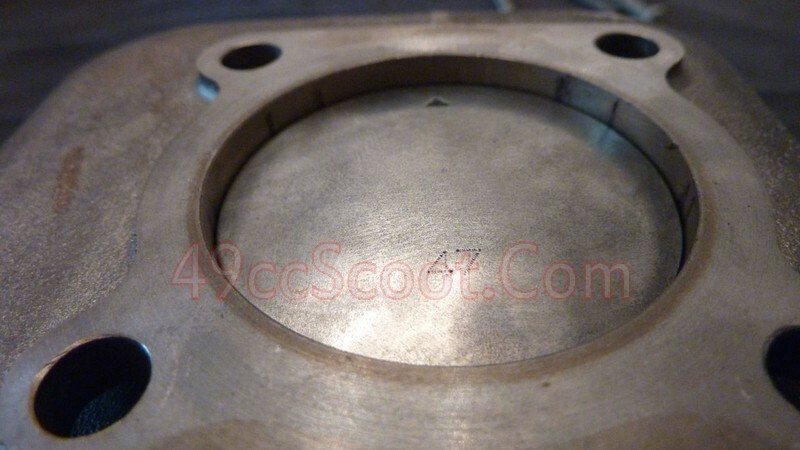 You should have the combustion chamber volume written down already, but you will need to find the head gasket volume, volume above above piston @ TDC to deck, and the piston crown displacement to compute the trapped volume. The head gasket volume is calculated the same way we've been doing all of the other cylinder volume measurements. You should have noted it's bore diameter and it's thickness. In this case think of the head gasket thickness as stroke in the other examples. Volume above the piston at top dead center to the cylinder's deck is calculated just as you've done other displacement calculations, we use the piston depth below deck @ TDC measurement as the stroke. To find the piston crown's displacement, you subtract the calculated volume, using the depth below deck for your test as stroke, and then subtract the actual volume that you measured with fluid. 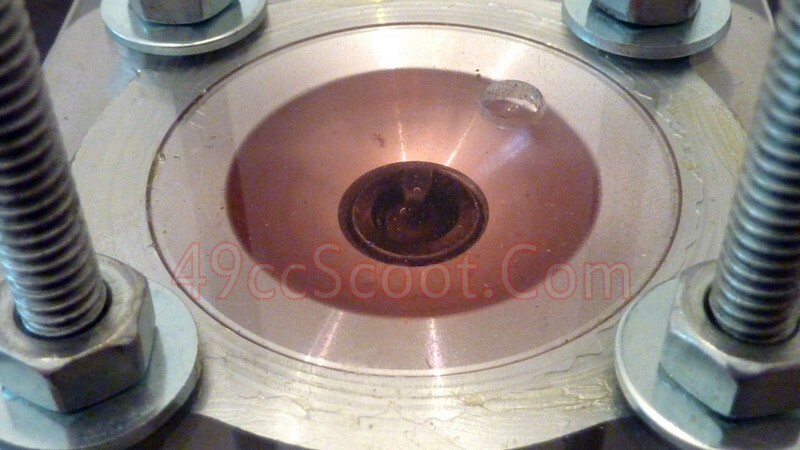 To be clear, don't use the depth below deck @ TDC, but the depth you set the piston below deck for your fluid test. With all of that information, we can finally get to calculating the trapped volume. At last, we have all of the numbers we need to do the final equation and determine uncorrected compression ratio. Now that we've got all of the data from above, calculating the corrected compression ratio is essentially just a two part process. We'll begin by determining the corrected displacement. That's the volume above the exhaust port to the top of the stroke, when all ports are closed. This is why you noted the depth of the exhaust port while taking measurements. The final step is to do the corrected compression ratio equation. It's the same as the formula for finding uncorrected compression, but you'll use the corrected displacement instead of total displacement.